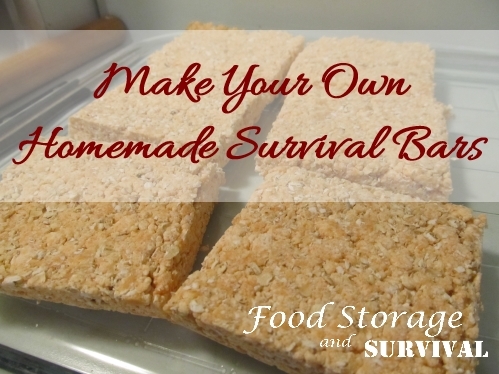 Make Your Own Homemade Survival Bars –Improved Recipe! 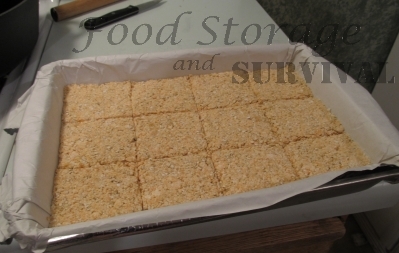 You may remember that almost five years ago we made these homemade survival bars. With approximately 2000 calories total, low cost, and long shelf life, these are a fantastic addition to your vehicle emergency kit or 72 hour kit. But there were some problems. Holy cow, they were hard to mix. Then they overcooked a bit and stuck to the pan. And finally, how in the world are you supposed to eat that brick? 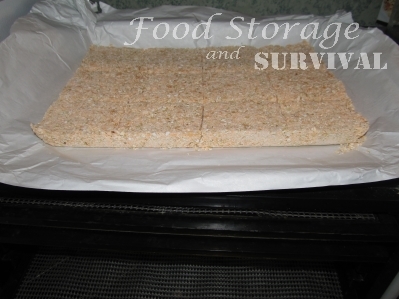 There were lots of suggestions in the comments to alleviate some of these problems, so I did some testing and today I’m sharing the results so you can make your own homemade survival bars even better! 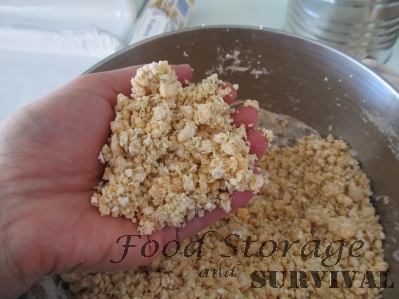 Mix the oats, powdered milk, and sugar together in a bowl. In a medium pan mix water, jello and honey. Bring to a rolling boil. This is just the 3 TB water called for in the recipe, not the cup of water you’d usually use when making jello. 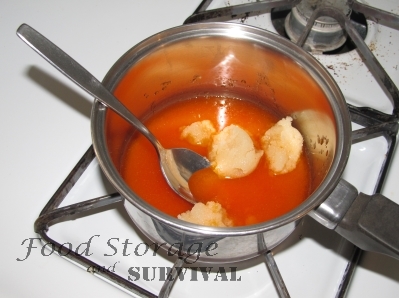 A rolling boil is when the mixture doesn’t stop boiling when you stir it. Using last year’s crystallized honey. Add jello mixture to dry ingredients. Mix well. 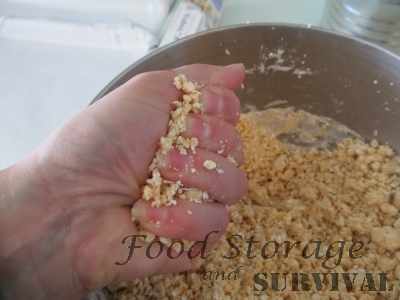 Mixing by hand, you’ll probably end up just working the ingredients together with your hands rather than trying to mix with a spoon. 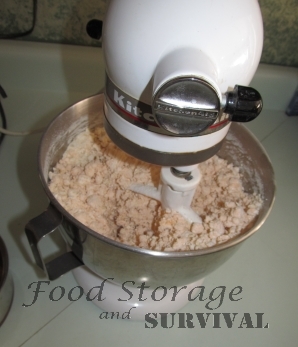 OR use a quality mixer and it’s done in a jiffy! My Kitchenaid had no problem mixing this dough. 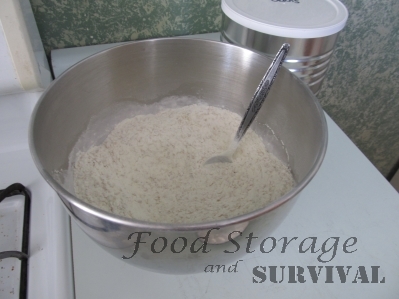 If the dough is too dry, add a small amount of water a teaspoon at a time. In my tests I added about 5 extra TEASPOONS of water total to the dough and I live in super dry desert area, so you may not need that much. Your dough should be crumbly, but stick together when pressed. As soon as it will stick together it’s done. Don’t add any more water. 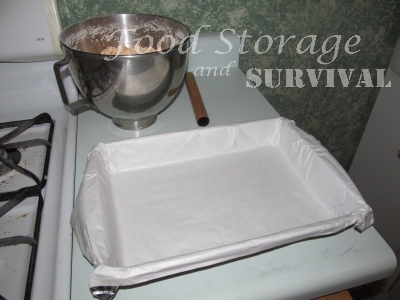 Press the dough into a 9″ x 13″ parchment lined pan. Line the pan with parchment. This is the pan liner I used. It has foil on the back side of the parchment. Regular parchment would work as well. Pour the crumbly dough in the lined pan. After I had pressed the dough in by hand, I used a tortilla roller (mine is just a piece of 1″ dowel) to even it out and press it in more firmly. Rolling it with a tortilla roller makes it stick better and be nice and flat all the way to the edges. Originally we made brick shaped loaves, but a brick shape is not very conducive to eating, and this stuff baked up so hard it could not be sliced, just broken into pieces. I also tried pressing the dough into a sheet cake pan, but the bars turned out too thin and crumbled after baking. Pressing into a 9″ x 13″ pan was magic. Here are the bars I tried making in a sheet cake pan. Just didn’t work well. Bars in a sheet cake pan were too thin and crumbly. Cut the dough into bars. Use a knife or a pizza cutter, but you’ll want to cut all the way through. Parts that were just scored and not cut through crumbled when I broke them apart. Now you can bake it or dehydrate it. To bake the bars, place the pan in a 200 degree oven and bake for 1 1/2 to 2 hours. When the bars are done baking, remove them from the pan by lifting the parchment paper and allow to cool. Separate the pieces. 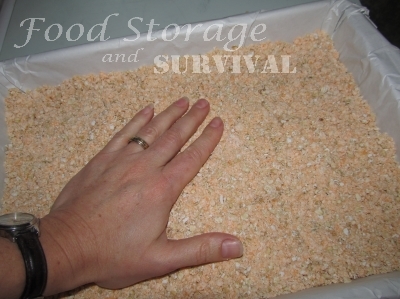 To dehydrate the bars, carefully pull the bars out of the pan using the parchment paper, separate, and place on dehydrator trays. 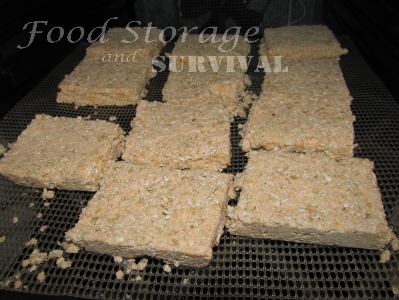 Dehydrate at 145 degrees for 4-6 hours until thoroughly dry. 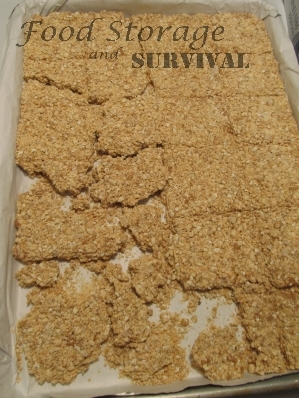 Dehydrated bars finished. These crumbled more than the baked bars. The heat does help these stick together better, so baking gives a nicer result than dehydrating. Pack them up. When they are thoroughly dry and completely cool, pack them into a zip seal bag, FoodSaver bag, Mylar bag, or wrap in foil. These bars have a very long shelf life. Based on the original ingredients, I’d give them at least 20 years properly dried and packaged. The short story on the bars we made almost five years ago is that they are still with us. 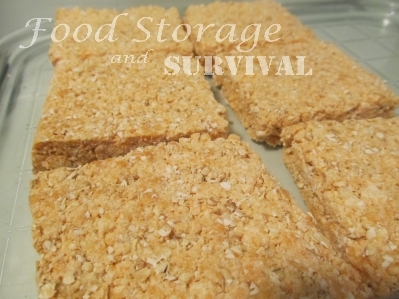 Approximately 2000 calories per batch, easy to make, and now easier to eat, these bars are perfect for your emergency kits! Once again, thank you for such great ideas. Can I replace the sugar with honey? If so how much honey total? Swapping honey for the sugar would alter the moisture level quite a bit. The sugar is part of the dry ingredients, so you probably wouldn’t need as much honey as sugar (also changing the calorie count) or you may need to add more oats or milk to help give it something to hold together. Not sure how well it would work. 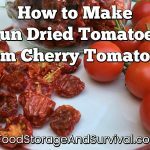 Do you think it would be OK to add dried fruit to this recipe? Would that compromise the long-term viability of the bars? What is the best way to store them for the long haul? THANK YOU! Yes, dried fruit would be okay. I would guess it would shorten the shelf life some though. For long term packing, I’d seal them in Mylar with an oxygen absorber. They may be hard enough to poke holes in a regular vacuum sealer bag, but Mylar 5 mil or thicker should hold them fine. These look really good. If I cut them into fourths, I could take one or two on long trail rides, and even bring one along for my horse! I’m wondering if I could add sesame seeds for added protein. How much could I add without changing the moisture level, or would they even affect it? 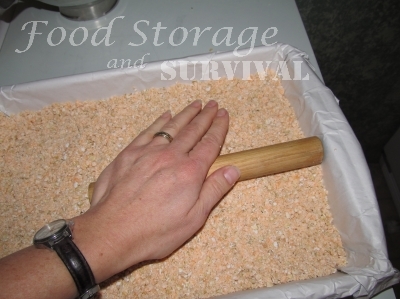 Would the sesame seeds go rancid if I used a foodsaver? Great revisions. I will definitely try this out later. Thanks for posting this up. It’s been a long time since you posted your recipe. I tried it before and yes it was really hard to eat. Hope I could get this one right. Thanks! Instead of using your tortilla roller, place a sheet of parchment on top of the dough and compress it with another 13 x 9 pan pressed down firmly on top of the dough. 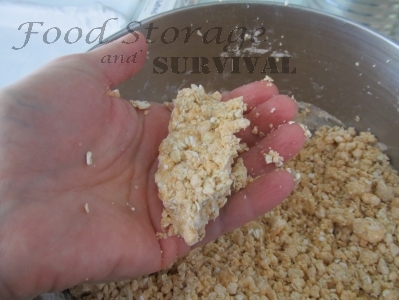 I use this method for my granola bars and it works wonderfully. Cheers! Excellent tip! I’m gonna do just that. Thank you! For each bar to have that number of calories, how many bars do you get out of one batch? I was only able to get 344 cal per bar (12 bars per recipe). I had to use brown sugar instead of granulated sugar and whole non-instant dry milk instead of nonfat dry milk to get there. Original recipe was around 225 cal per bar. The calorie count is per batch. They were originally formed into one large loaf-shaped bar so it was 2000 calories “each”. I’ve adjusted the wording in this post to be more clear that the calorie count is for the entire recipe, not just one of the small bars. If you got around 225 per small bar, then the total for the entire recipe would be closer to 2700 cal. Thanks for your comment! What about protein powder? Would it be good idea? Yes, you could add protein powder. It may change the shelf life–You’d have to check the shelf life of your particular brand of protein powder. I’m going to try this with whey protein crisps and dehydrated goji berries. How eatable are they now? Could they be tolerated well by a younkling or a living ancestor or are they strictly for the square of jaw and mighty of dentition? The original bricks are super hard and their shape makes them difficult to get a piece off of. Maybe with a rock or a hammer. The new flat version are nice and hard as well, but they are easier to break into pieces. If you soaked either one of them in liquid they’d soften up enough to eat it even if you didn’t have a full set of teeth. Basically make oatmeal soup with them. Just reviewing the instructions again and one of the photos gave me pause. The one where you’re boiling the jello mixture. Does that photo *really* contain only 3 T of water or were you making multiple batches (for all the experiments)? It would seem to me that 3 T of water would require a much smaller pan to cook it in. 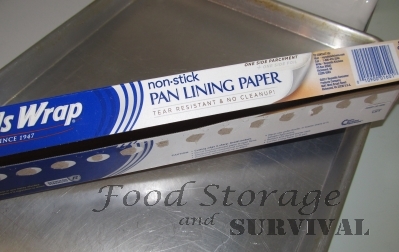 Oh, also, I’m impressed by the “pan lining paper”. I’ve never seen it before and the “parchment paper” that I use would *never* line a pan in that way. I’m gonna look for it now; might have to buy online because I consider myself lucky to find parchment paper in the store. Once again, thank you for your website and all that you share with us. 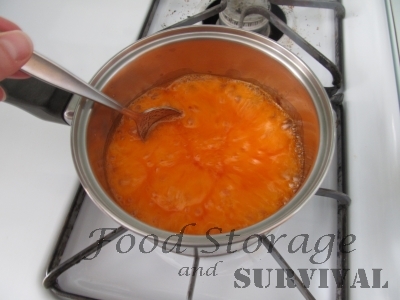 Yes, only 3 TB water in the pan, but the honey adds liquid as well. The picture might make the pan look larger than it is! I’m not so keen on the “jello” component; whats the main reason for including it in the recipe? I am going to try using blackstrap molasses and chia seeds for more nutritional content, and make them as tasy as poss so that I can rotate them annually. Also, theres no oil or fat in here and the body also does need that, and that is found in most of the commercial emergency foods like Seven Seas and NRG, that might also help to make it moister. I’d guess that oil/fat in the bars would shorten their shelf life because they go rancid. I’m also guessing that jello (or plain gelatin) add “stickum”, helping the bars hang together. Looking forward to seeing replies from others on this. These are bug out/get home bars. You need MAXIMUM calories for MINIMUM weight/.bulk – not protein or vitamins/minerals. You can catch up on the other stuff after you get home. For bugging out, once you get three or four days out you’ll be hunting/fishing/trapping/foraging for the foods that provide vitamins/minerals/protein/fat/carbs. In the mean time, a good multi-vitamin/mineral supplement wouldn’t hurt and adds virtually nothing to your pack. Stick to the recipe to maintain shelf life. Add packets of peanut butter, trail mix (both provide fat), freeze-dried fruit and chewing gum/hard candy all of which provides comfort food and good calories (and don’t forget the coffee/tea}. For a warm, end of day pick-me-up, crush ramen noodles (takes up less space) and put them in double zip baggies squeezing out as much air as possible and remember, if you’re in or close to an urban area, most survival water purification straws do NOT eliminate viruses so pay extra for a straw that eliminates viruses or always boil your water or use purification tablets. The only 3 things the body needs for a three day march to a BOL or to get back home are water, energy (kCalories – the whole purpose of such bars) and minerals since they get leached out in sweat and can result in cramping. Therefore the only thing I would add to these bars is about a teaspoon of Sea Salt to complement the vitamins, minerals and enzymes in the honey. It might even prolong the shelf life a bit and should improve the palatability. Hi PR. I haven’t been thinking of these bars as something you eat for 3 days. I couldn’t tell you why, but I imagine them to be a staple for a longer period of time. In which case they may need to cover more bases than calories & minerals. Is there a reason that these bars *shouldn’t* be used for longer than about 3 days? Thanks. Too much sugar. Too many empty calories. These are designed to provide quick energy for the short term – a sprint. For longer term you want meat and veggies and fruits as well as carbs. For the intermediate term, after the 3 day sprint and before the garden comes in and your traps, fish nets, etc. begin to yield protein (which I presume you can preserve), you’ll want preserved foods like canned goods (meats, fish, veggies, fruits, beans), smoked/dehyrated meats/veggies, etc. and bulk foods like corn, wheat berries, soybeans, beans, oatmeal, rice, honey, etc. Learn to make bread (wheat berries & honey) and stock/learn to make the rest of the ingredients (like yeast and oil (get a press for nuts, soybeans, corn)). If properly packaged, nuts will last about a year. A couple nut trees in your back yard and bug out location would be valuable both for food and for trade. There is, of course, much more and I recommend that you go on YouTube and begin exploring the rich resource available there on virtually any survival tactic/topic you can think of. Why does the sweetness bother you, Carol? Angela has tried this and would surely warn us if it was unbearably sweet. Otherwise the added sugar is another source of calories. Air (oxygen) is the death of most food and especially oil. If you have a vacuum sealer, put a small chip of dry ice in the bag, stand the bag upright (CO2 is denser than air and will displace the air in the bag. After ALL the dry ice has evaporated (otherwise it might explode), keep the bag upright as you vacuum seal it. Any residual gas in the package will be inert CO2 and not reactive O2. 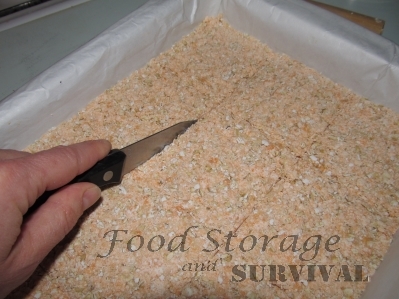 If you crush the square and add powdered milk, cinnamon and a small, double zip baggie with coconut oil (push the air out) before you do the CO2 vacuum seal, the addition of hot water should make a tasty breakfast cereal. 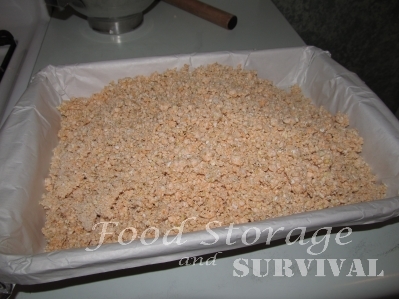 Add some freeze dried strawberry slices or banana chips too. I was wondering also about using sugar free jello. I am diabetic & wouldn’t be able to tolerate all the sugar, however, they sound great for the rest of the family. I would really like to think of some way to incorporate this for myself without all the sugar. Maybe use some stevia, more oatmeal, & sf jello? Guess I could play around with the recipe to see what I might be able to come up with. I have diabetic daughter as well & we would need something we could use. Thanks for your post…it’s great! Has anyone been able to find that Reynolds Pan Lining Paper? Seems like a great product but I can’t find it anywhere. If we have a dairy allergy, could we omit the powdered milk or would we need to sub with something else? You could omit the powdered milk. It will decrease the nutritional value some, but you’d be able to eat it! If you don’t want the sugar (or food dyes) from jello perhaps gelatin could be used instead. The point is the calories. Remove the sugar and you remove the calories. I made these and left out the sugar and they were still so sweet I could barely eat one bar. Then I was so thirsty, I drank a quart of water in about 15 minutes. In a survival situation you do not want a food like that, in my opinion. Also, just because each ingredient stores well does not mean the finished product will store well. Be careful! I just made my second batch of this. I problem is that they are so darned good. I do have a fatal allergy to honey so I substitute real maple syrup. I have thought of trying sorghum. Liked the idea of putting some salt in. My first batch had a few loose crumbles so I poured on milk. Made really good cereal. What is the shelf life on these? Are they like the package store bars and USCG bars that have a life of 5 years? Thank you.